A freight train hits you just as hard, whether you’re blindsided by it or you saw it coming from miles away. Kevin is the third old cat that Gwen and I have had to euthanize, after Oscar and Squeaker. In Kevin’s case, we had a better sense that he had little time left, but being mentally prepared doesn’t lessen the impact. 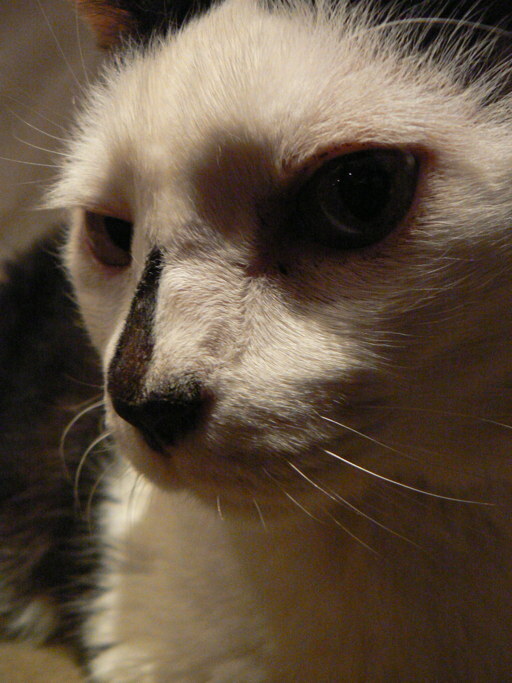 Kevin came into Gwen’s life as a young, scrawny tomcat in 1994, not long after she moved to Austin. Gwen already had Oscar and didn’t want another cat, but he kept hanging around in her garden until she took him in. After Oscar established that she was the boss, the two of them were buddies forever. Once a part of Gwen’s household, Kevin filled out to a majestic 17 lb. Every cat has his or her own personality, and, apart from his fear of small children, Kevin’s was always unceasingly sweet and happy. He would start purring the moment anyone picked him up. 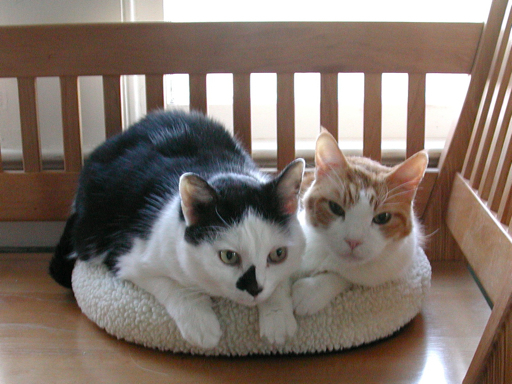 Four years ago, Kevin lost his best buddy Oscar, and it was clear that he was lonely. When we got a pair of kittens two and a half years ago, one of the two, Bubka, decided that Kevin was her new best friend, and so happily he had another excellent cuddlebuddy in his later years. We’re not sure how old Kevin was—we estimate he lived to be 19. Old age was not easy on him. He developed an allergy that could only be treated with prednisone (though for a full year the previous vet insisted it was behavioral). He became completely deaf and his vision deteriorated. He suffered a herniated disk in his spine that left his hind legs wobbly. He was recently diagnosed with intestinal cancer. But his sweet disposition remained unchanged. It seemed that he never stopped enjoying life. This morning he was too wobbly to even sit up, and was not purring. He was clearly having intestinal distress. His condition improved a little as the day went on, but we knew it was time. He spent the day lying on the back porch with Gwen, with friends dropping in to say goodbye. (Gwen here.) One of Kevin’s nicknames was “Kev-Dog”—after his entirely endearing trait of simply following me around the house like a good dog so he could always be in on the action. His favorite thing was to enjoy a good book with me, stretched out on my legs on the couch. And sleeping all night as near to my head as I would allow. He was loved by many, and his sweet nature won over more than a few cat-dislikers. He had a bad spell once that involved a urinary catheter and a move from the vet to an emergency hospital—when we saw the vet after a miserable long wait, she looked at him and said “This must be Kevin,” and he started purring loudly. He was that kind of guy. A word of grateful thanks to our excellent vets at Austin Vet Hospital (especially Dr. Besch) and their caring staff. They looked out for him in a way that I would wish for animal friend. My sympathies to you both. What a great eulogy. As a cat owner, I have found it harder to lose my cats than people in my life. Reading how Kevin was such a part of yours, I think you may understand that a little. It’s wonderful that you gave Kevin the life he had. You gave him a reason to purr. Losing your pets is always horribly painful. Love to you and Gwen. RIP, Kevin – you sound like you had a long, full, lovely life, and that you left gracefully. Adam to you and Gwen I know how painful this must be. I am so grateful you provided this wonderful cat with a wonderful life. our thoughts are with yall … sorry for the loss. No doubt, had I the pleasure of meeting him, without my annoying kids in tow, I would have loved him, too. You were mutually blessed, but I’m very sorry for your loss. What a great cat! I’m so sorry. So sorry to hear amigos. It’s so sad when they leave us. I’m so sorry. Losing a cat who’s been with you for so long is just awful.